There is nothing that gets my creative juices flowing (is it just me, or is that expression kinda gross) than working with fellow bloggers. I love hearing their ideas, experiences, tips and advice because, let's face it, no one really gets this gig unless they're rocking it out just like you are. I'm often asked how I meet, work with and build supportive communities with other bloggers - and every variety of that question is usually followed up with "so, do you guest post a lot?". In my experience, the Guest Post is the least exciting, least beneficial way to work with another blogger. Not only do page views suffer but traffic back and forth can be less than inspiring - and then there's that little worry in the back of your mind that you are allowing someone else to create content for a space that you've worked so hard to build, shape and develop. I say let's move on from the Guest Post and work with the amazing creatives around us in ways that are fun, inspiring and beneficial to everyone involved. I'm rounding up 4 ways that I've personally worked with other bloggers that will help both of you create new content, score gorgeous imagery and introduce your brand to new followers. Get together with another blogger in person, over the phone or FaceTime and talk fabulous content! While this can, of course, be done in a group, I love the one on one aspect for this particular partnership. Brainstorming sessions are one of my all time favorite things to do with other creatives, especially when I'm feeling burned out on my own gig. When my usual topics seem boring and stale, I see so many opportunities for amazing posts if only I were my fellow blogger! Sounds crazy, but I look at the ideas, outlets and concepts in another genre and think about how I would tackle them - you'd be surprised how often we overlook the really cool opportunities right in front of us because we assume everyone already knows the info or wouldn't want to read such a post. When another creative tells you they'd love to write a post like that, or better yet, read and share a post like that, it inspires us to look at our content with a new perspective. Here's a great example: I met Amanda of Amanda Louise Interiors for the first time and basically lusted after all of the gorgeous spaces she had created in her recent design work. I rattled off 10 or so posts that I wished she would write just for me to read: how to style bookshelves, how to mix in a signature color (like, uh, orange), what to do with your bar cart once you have a toddler who can destroy it, how to keep a space light and bright but still use color - the ideas seemed endless to me. Amanda, on the other hand, thought "how to style a bookshelf" was common knowledge because she happens to be a pro at it and would have skipped the topic on her blog all together. Instead, we brainstormed a series where she will style the same book shelf three or four different ways to address all decor styles (antique lover, family photo hoarder, book collector, etc). I'm still waiting for her to write those posts (ahem, get on that, friend!) but when she does, they will be amazing. Amanda then asked me all of her burning Instagram questions - everything from how I shoot my photos to how she should work with brands in her feed. To me, some of that was just second nature but laying it all for an Instagram virgin allowed me to see the process with a fresh set of eyes. Our conversation became the base for the talk I just gave at the Creative Counsel Conference - and I loved every single second of it. Knowing that there are amazing posts to be written (that someone I admire and respect would want to read) just at my fingertips always sends me home with a fresh batch of enthusiasm and a new list of post ideas. No matter how patient our husbands, partners or non-blogging friends are, they don't typically have the tolerance to snag just the right detail shot of our manicured fingers wrapped just so around our statement mug full of artfully designed (and now freezing cold) coffee. But you know who does? A fellow blogger. Not only does she totally get it, she knows how to shoot it, has an amazing camera and wants the same shot for herself! As a bonus, she respects the process and doesn't for one second question why one would need to go to so much trouble to snag a shot of a pair of shoes or the perfect peony (have I dropped enough blogger cliches in this post yet??). So why not get together with a fellow blogger, cameras in tow, and shoot photos for upcoming posts? Hell, change outfits multiple times, switch up your hair and make up, find an amazing back drop and shoot photos of each other to your heart's content. I know that I tend to be more comfortable with a friend behind the camera and won't hesitate to ask a fellow blogger to grab a certain shot or angle, something I may not be comfortable doing with a pro photog. As a bonus, I am always looking for time to practice my camera skills on a subject that isn't a Tasmanian Devil of a toddler, so if you're learning your camera or how to shoot in manual, a willing blogger is the perfect test subject. Bottom line: you'll end up with gorgeous content for social media and lead images on your blog posts without shelling out major cash for a pro photographer. Make sure to tag your blogger photo partner in all shares so that she gets a little love and exposure and she'll do the same for you! Just don't forget to set the self timer and grab a few of the two of you to document your adventure - and to reward yourselves with a fabulous brunch after all of your hard work. Is there a local business, coffee shop, restaurant or haunt that you've been dying to visit (and photograph the living daylights out of)? 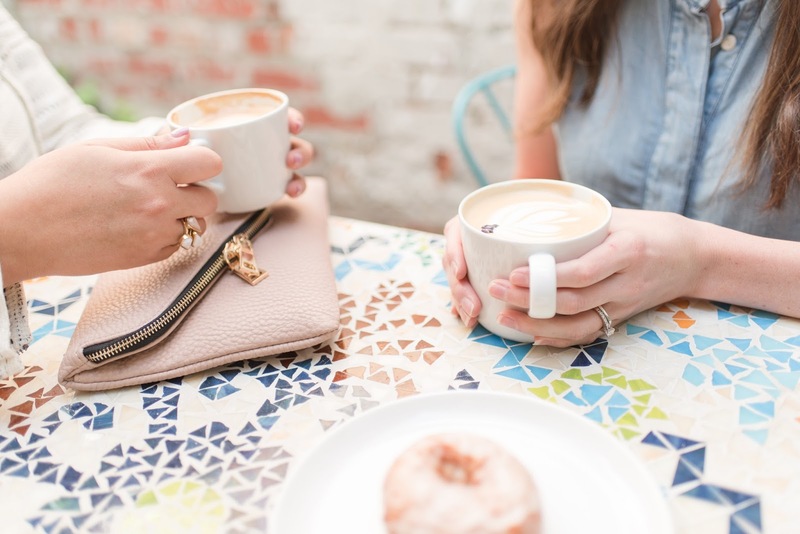 Why not plan a blogging date with a fellow local blogger (or two!) and head over there with your photographer in tow? I'm a huge fan of my friend Lauren's About Town series and recently asked her if I could crash one of her sessions. She was sweet enough to agree and we drug Christa along to photograph both the space (The Village Grind, for locals!) and the first few minutes of our get together. We grabbed solo shots, amazing lifestyle shots of the coffee shop and content for both of our posts. Christa popped out and we sipped coffee, chatted motherhood and I smothered Lauren's sweet baby with all kinds of love. Because the photo portion of the date was so short, we had photos back ASAP and each wrote posts featuring our date, the local coffee shop and how good a little girl talk is for the mom soul. Bonus: we were able to use a pro photographer without spending a ton of money because we split the cost of her services. We each received the same gallery of images but our cost for the outing was much less than if we had set up a solo venture. Be sure to check with your photog and let her know that you'll be working in a pair or group and make sure she's on board, but splitting the cost of the session makes pro photos doable for newbies and veterans alike. Whether it's #womencrushwednesday, #momlovemonday or #followfriday, take advantage and share each other on your social media channels. I love to find amazing feeds and reads that come highly recommended by others that I follow. As a word of caution, my suggestion is to only share and recommend other bloggers that you do truly love and follow. If you've worked together previously (say, in a brainstorming session), it's super easy to Instagram a shot of the coffees (or cocktails) from your get together and say that you had a blast talking shop with @soandso. Make sure to tag your blogging bud in both the caption and the photo to maximize her exposure! If Instagram isn't your jam, share a fellow blogger's post on your blog Facebook page. Shares of content other than your own helps crack the Facebook feed algorithm for your own page and sends new readers/page views to the author. What's not to love about that? And don't forget Pinterest - pinning a fellow blogger's content to group Pin boards not only helps your Pinterest Profile (again with the algorithms, ugh) but could send tons of traffic to a blogger's dot com. If you happen to have a huge Facebook following and your blogging bud happens to rock Pinterest, do a content swap where you each share a banging post written by the other on your most popular channels. You should see page views, new followers and traffic spike with little to no effort. Instead of a traditional guest post, why not do an interview style post where you each ask the other questions about the same topic. For example, I wrote a post on the 5 Things I Wish I'd Known Before I Started Blogging and I would love to hear what 5 things would make some of my fave blogger's lists. You could use this as an opportunity to tackle a subject that is outside of your typical post genre or, if you're both in the same line of blogging, you could stay industry specific. This partnership idea is perfect for long distance blogging friends who can't get together in person - decide on your topic, email each other your questions and get to work! Each of you publishes a post sharing your fellow blogger, why you think she rocks and her amazing responses to your fabulous questions. The spontaneity that could come from two different creatives coming up with interview style questions should result in really fun posts to write and, more importantly, read! There are really some things that only other bloggers can understand: the ups and downs of growing your brand, negative comments, "lost" opportunities, the time commitment, lifestyle choices that come along with being a blogger, those moments when you find yourself comparing yourself to others - it may all sound so meaningless to some but to another blogger, it's all in a day's work. Reach out to your trusted blogging partner, mentor or sidekick and ask them for support when you get lost in the downside. A fellow blogger can respect your concerns while reminding you of all that you've accomplished - and will undoubtedly help you work on a solution if needed. I am lucky enough to have Colleen as my Blogging Support Shoulder To Lean On and text her often with something like "well, I'm a failure today....". She is always careful to respect my concerns without dismissing them and then to let me vent if that's all I need, or to remind me of all that I've accomplished, or help me work out a game plan to turn things around. She and I have never met in person, live a few states away from each other and I couldn't do it without her. Ok, now it's your turn to spill the beans. What are your favorite ways to work with other bloggers? Leave them in the comments below so that we can all steal your ideas! P.S. Wanna pin it? Go for it! Yes, yes, yes! For me blogging is all about community and working with other bloggers. These are all fantastic ideas. I agree, guest posting is totally out the window! This post is crazy filled with good stuff! I loved reading it all now but I went ahead and pinned it to reread (over and over) again in the future. Great work! Love this! This is one of my goals to do 2x a month and it's been very helpful! Thanks for sharing! I love collabing with other creatives! The support and ideas you get can completely rejuvenate you! Great ideas! I will be taking notes from this! Happy saturday! Seriously love this! I've always been afraid to have a guest blogger, because I don't want to risk having less-than-stellar content on my blog. But these are awesome ideas that I will definitely be using! Thanks! LOVE all of these! I so wish I knew more bloggers close to me to do some of these, but I love the brainstorming one since we could totally do it virtually! This is really good stuff!! Thank you so much for sharing!! These are great tips, thanks for sharing! How do you feel about link ups? I participated in a few last year and really enjoyed them. I'm considering organizing 1-2 a year. It was a great way to be introduced to new blogs. It was also nice to have a blog topic pre-determined. Less brain power for the participants! I would LOVE to partner with some new and some experienced blogs!! This is such a great article for a new blog mom ;) Anyone interested? Email me at summer@blondewifelife.com ad reply to this comment so we can collab!! Love this!!! So many good ideas. It is so true no one understands you like another blogger. I am always re-energized about my blog after talking to another blogger!! !